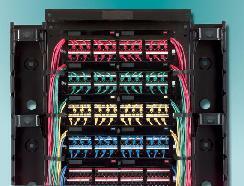 Today's business communications systems require a robust mix of cabling equipment, design and maintenance. Whether you require voice cabling, data cable or fiber optic cabling, L.A. Forbes Communications is the source for quality installations by knowledgeable cabling technicians. We install category 5 (CAT5), Category 5e (CAT5e), Category 6 (CAT6), Fiber Optic and telephone cable. L.A. Forbes Communications can also Organize cable throughout your network, within the equipment room and to the workstations. 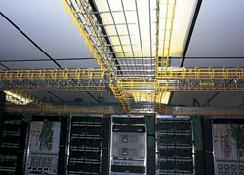 Vertical and horizontal cabling sections create organized cable runs within and between equipment racks and cabinets. 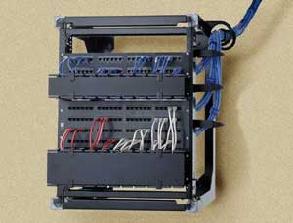 Unigue vertical cable managers provide a variety of cable management options within the cabinet. Patented systems meet cabling industry standards and facilitate orderly cable bundles and improved function. 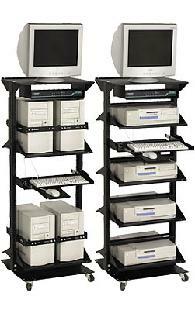 Cable management fingers, spools, dividers, straps and other accessories provide a high level of cable organization. To guarantee the performance of the system the cables must be installed carefully and conform to the standad in terms of bend radius, puling forces and bundle dimensions. When mounted on a 19 inch rack-mount panel, the S110/210 cable managers provide superior cable management in a compact space. 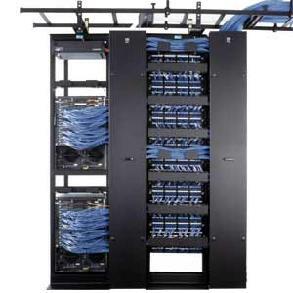 Their 1 RMS and 2 RMS size and large capacity provide excellent cable management for 19 inch rack mount installations. Covers are included with the cable managers to provide a clean appearance. Clean up clutter and save space while organizing your desktop or tower servers. Simply arrange four CPUs, one keyboard, and one monitor on one attractive, organized rack. EZ Tray cable tray are made of high mechanical strength steel wires and is designed to perform with a full volume capacity load of cables. 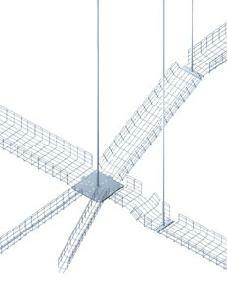 It's unique mesh structure exhibits load characteristics similar to a "net" rather than a beam. For loading questions call L.A. Forbes Communications, Inc. The unique mesh design of the tray does not fail as a beam would fail if it is overloaded.